One of the defining features of U.S. monetary policy over the past five years has been its incredibly ad hoc nature. Over this time, the FOMC has conducted monetary policy with a spate of make-it-up-as-we-go-along programs (QE1, QE2, Operation Twist, QE3, and the Evans Rule) that it hoped would spur a robust recovery. These programs did get progressively better as they became more state dependent, but they were often implemented and ended in a haphazard fashion. This stop-go approach to monetary policy was politically costly and prevented the Fed from fully utilizing its ability to manage expectations of future nominal growth. A great example of the Fed's ad hoc management of monetary policy is the tapering of QE3. Former Fed chair Bernanke announced it in the Spring of 2013, but the Fed kept the markets guessing for almost nine months as to when it would actually begin. And once it got started, some FOMC members were still uncertain about how much to do. Consider also the Evans Rule. It was implemented to firmly shape expectations about the future path of the federal funds rate. It was, in other words, created to increase certainty. However, when the unemployment threshold in the Evans Rule was no longer was consistent with FOMC preferences, the FOMC simply dropped it. So much for certainty. With decision making like this, FOMC officials themselves are uncertain as to what they will be deciding at the next meeting. the [Fed's] muddled communications aren't a gaffe. They reflect a muddled policy. The markets are obsessed with every syllable Yellen utters because they're so unsure about what the Fed is going to do. Its behavior is difficult to predict. It has acted in an ad hoc way for the past several years and has never bound itself to any rule. What the Fed instead said last week is that its policies "will take into account a wide range of information, including measures of labor market conditions, indicators of inflation pressures and inflation expectations, and readings on financial developments." There is nothing here that constrains the Fed's decisions or offers much guidance to those seeking to predict them. The statement might as well have added "the price of gold" or "the gut feelings of the Fed's open market committee" to its list of indicators. I think it is absolutely ludicrous that the Fed is trying to claim the dots have no value. Seriously, can they work any harder to raise the act of bungling their communications strategy to an art form? If the dots have no value, then why force feed this information to market participants in the first place? Tim Duy is right. The dot-plots were suppose to improve clarity about the future path of monetary policy. To claim now the dot-plots really do not show the future path only adds more noise to an already weak signal about where monetary policy is heading. 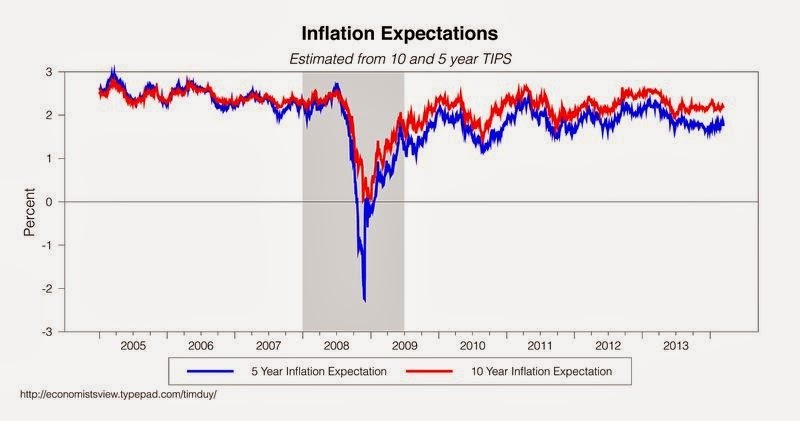 Tim Duy notes elsewhere that breakevens--the expected inflation implied from the spread between nominal and real treasury yields--have become more volatile since the crisis. This can be seen in his figure below. Arguably, this too is a consequence of the increased uncertainty surrounding Fed policymaking. Now imagine the Fed's monetary stimulus programs during this time had be done in a more systematic and predictable manner. For example, assume the Fed had announced a NGDP level target from the start and said asset purchases will continue until a certain level target was hit. There would have been no need to announce up front the large dollar sizes of the asset purchases that attracts so much political criticism. There would also have been no need to announce successive rounds of QE that make it appear the previous rounds did not work. More importantly, this approach would have more firmly shaped nominal spending and income expectations in a manner conducive to economic recovery. In other words, there was a much easier and more efficient way for the Fed to respond the crisis. FOMC meetings would have been more predictable and consequently less important. We would not be hanging on the every word of our Fed chairs. Fed watchers and bloggers would be far fewer. It is true that implementing something like a NGDP level target would have used up a lot of the Fed's political capital. Some will conclude, then, that this reality could never have happened. My reply is that it may have politically cheaper for the Fed to do a NGDP level target than it was to do all the impromptu programs it adopted over the past five years. But this is just Monday-morning quarterbacking and not the main point of my post. The key takeaway is that the right-kind of systematic monetary policy would have been far better in the crisis and would be far better moving forward. Instead, it seems that Fed policy is actually going the other direction. It continues to be ad hoc and unsure of itself. This does not bode well for future economic crisis. Update: Philadelphia Fed President Charles Plosser makes a similar argument in a recent speech. He notes that forward guidance would be more effective if monetary policy was more systematic and followed some kind of rule. My implicit point above is that a NGDP level target would be just such a rule, as I have argued elsewhere. "Fed watchers and bloggers would be far fewer." So true. It does not feel safe yet to just "step away" from the computer. At all. I do wonder what will happen to economic blogging once we get back to full employment. I imagine there will be more interest in microeconomics-related issues and Freakonomics-type posts. David, it will always be possible. I started off writing on the US economy in 1994. For the next two years I was living and working in Minneapolis. And I started doing it because no one (maybe a few) believed there was a GM going on... Greenspan was always behind the curve and inflation was lurking. My writings over the 1994-2000 period was turned into a 400 page book (as usual, full of charts). The macroeconomy is very little understood, so there will always be possible to "discuss it". Oh, there will always be something to write about! Well it's true that U.S. monetary policy over the past five years has been its incredibly ad hoc nature but still it has some positive aspects that often people don't think about. Market Monetarism and Endogenous Money? What is the Fed's Real Inflation Target? What Could the Fed Have Done Differently in 2008?